Last week the Dutch Ministry for Infrastructure and the Environment published the latest figures of traffic mobility in the Netherlands. The document “Mobiliteitsbalans 2011” has a summary in English (from page 123), in which we can read the following interesting facts. Following remarkable growth in the 1980s and 1990s, the total amount of national mobility of people in the Netherlands has not increased since 2005. This particularly applies to car use. Half of all journeys in the Netherlands were undertaken using cars; a quarter by bicycle; one in five by foot; and one in 20 by public transport. Of the total amount of kilometres travelled, car use accounts for nearly three-quarters of this total, while public transport accounts for 13 percent and bicycles for 8 percent. This division of journeys among the various transport modes has remained relatively constant over the past 10 years. Approximately half of all the kilometres travelled had a social-recreational motive: visiting family or friends, going out or recreational trips. Since 2000, the largest growth has occurred in home-to-work travel: an increase of 18 percent. Over the past 10 years, bicyclists travelled a total of 13 percent more kilometres. This is partly attributed to population growth, but is primarily owing to the fact that journey distances by bicycle have increased. The main reasons for this are the increased scale of the various service providers (schools, shopping malls, banks, sports accommodations, etc), and the expansion of urban areas. Home-to-work distances have also become longer. Bicycles are increasingly used in combination with train journeys, accounting for, at present, 4 percent of all journeys by bicycle. Approximately 40 percent of all train passengers use bicycles to travel back and forth from their homes and train stations. Seventy percent of all journeys are shorter than 7.5 kilometres, of which bicycles and cars both account for approximately a 35 percent share of such journeys. Public transport is largely insignificant for short distances. Bicycles are used for nearly half of all home-to-work journeys of up to 7.5 kilometres, and for more than half (55 percent) of all short journeys to and from school or educational courses. When engaging in daily leisure activities situated close to home, people primarily walk or ride bicycles. For business-related journeys (73 percent) and daily household activities (41 percent), cars are the dominant mode of transport. In the three urban areas of Amsterdam, Rotterdam and Eindhoven, peoples’ travel behaviour when travelling short distances varies greatly. 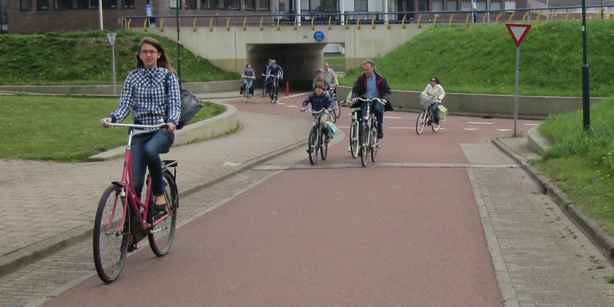 Cars are more often used in Eindhoven and Rotterdam, while bicycles predominate in Amsterdam. Within Amsterdam city limits, cars are much less often used than they are in Rotterdam and Eindhoven. For journeys between city centres and other municipalities in these urban regions, the car predominates. Differences between the various urban areas are found in their parking policies, the spatial structure of the city (region), the composition of the population, car ownership rates, and the supply of public transport. The precise contribution that each of these factors makes towards regional mobility cannot be stated at this time. From 2000 to 2010, the number of traffic fatalities decreased by 45 percent, to 640 deaths, despite an increase in mobility during this period. This decrease was primarily a result of safer cars (due to airbags, for example), safer road designs (roundabouts, 30 and 60-km speed limit roads), information and enforcement. The number of serious traffic-related injuries during the period 2000-2006 remained stable, but rose by 20 percent between 2006 and 2009, with this increase primarily resulting from an increase in the number of accidents involving bicyclists, in which no motor vehicles were involved. The increasing number of injuries is of course bad news. Other studies reveal that a lot of these incidents not involving motorized vehicles have to do with bollards, scooters, the aging population (more older cyclists) and even a number of severe winters with more icy conditions. A lot of study is already undertaken to tackle this problem. The above is all mentioned in the summary in English but I’d like to end this post with the table on page 29. The bicycle plays a major role in the travel behavior of the people in the Netherlands with a quarter of all journeys. This high number cannot be found anywhere else in Europe. You mentioned that the increase in cycling injuries is due, in part, to bollards. Are people crashing into the bollards that planners like to stick in the middle of cycle paths to keep cars out? I have an idea for the Dutch road managers. How about using special cameras to photo and ticket cars who enter cycle paths? As for mopeds on same paths, you can use a similar design with the photos. That might get a few off the paths. The other things that usually are causing casualties and injuries are old road designs that have yet to be updated, or intersections that could become roundabouts or downgraded to access roads. Access roads could be designed to include raised intersections and more brick paved roads could help enforce the 30 km/h limit. Intersection improvements with grade separations, lower waiting times and waiting time indicators would help people not get tempted to run the red light, including pedestrians. Cycle lanes and mixed roads could get cycle paths, often in Zwolle for instance. Intersections not large enough to have separate turn stages and bicycle stages could get simultaneous green as a way to avoid the mixing conflicts. As you no doubt know, one of the reasons offered for why the Dutch (or Danish) experience could not be repeated in the UK is that the Netherlands is flat. So how would one explain the 11% modal share (5.5 times the UK figure) in Switzerland? First of all, not all of the UK is mountainous and secondly: it may be flat over here, but try cycling into a head-wind for an hour. With mountains there are moments you descend every once in a while, but the wind just keeps on blowing. And no matter what direction you ride, there’s always a head-wind. London was quite flat, last time I visited it, and I would have loved to cycle there, but I was not suicidal at the time and my host wouldn’t let me. Paris is doable, as most of the French seem to be getting used to us cyclists. I did an early morning tour a week ago, and it was great. Hardly any traffic and the few cyclists about even waved at each other. In short: people cycle because they feel safe enough to do so. The table shows the modal share of trips by bike comparing the Netherlands and Denmark, with the Netherlands being six points higher. What would a table comparing the two countries on kilometers cycled by bike show? 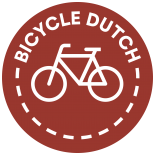 Do Dutch cycle longer distances than Danes? I have seen reports somewhere that claimed the Danes cycled slightly further on average. But now that the Dutch cycle 13% longer than before it might have turned around again. It should also be noted that those modal share figures are for the countries as a whole. And there are regional differences in both countries. For Denmark there is a considerable difference between Copenhagen (high) and the rest of Denmark (low), whereas in the Netherlands the differences are there, but not that considerable. A lot of these one-sided bicycle accidents are due to children texting on the bicycle or bicycle steers getting entangled, or both. But I must say we did have some winters with an abnormal amount of ice and snow. To check if that was the main cause, we would just have to look at the figures for pedestrians. If so,the would show the exact same rise in accidents. This entry was posted on 1 March 2012 by Bicycle Dutch in Original posts and tagged figures, modal share.